Published on Friday, May 27, 2016. 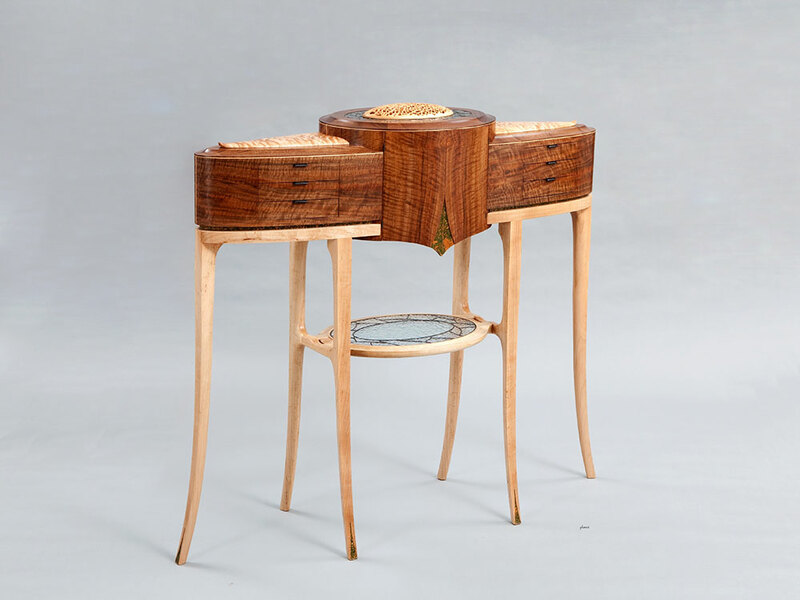 Currently on view at the American Craft Council office in Minneapolis are a number of pieces by local artist (and ACC member) Mark Laub. 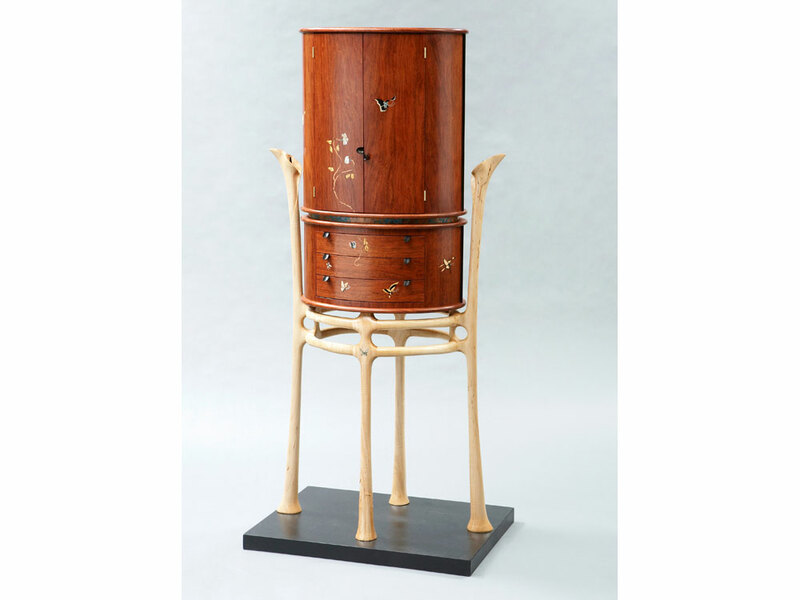 His intricate furniture pieces are full of suprises and small, fascinating details. 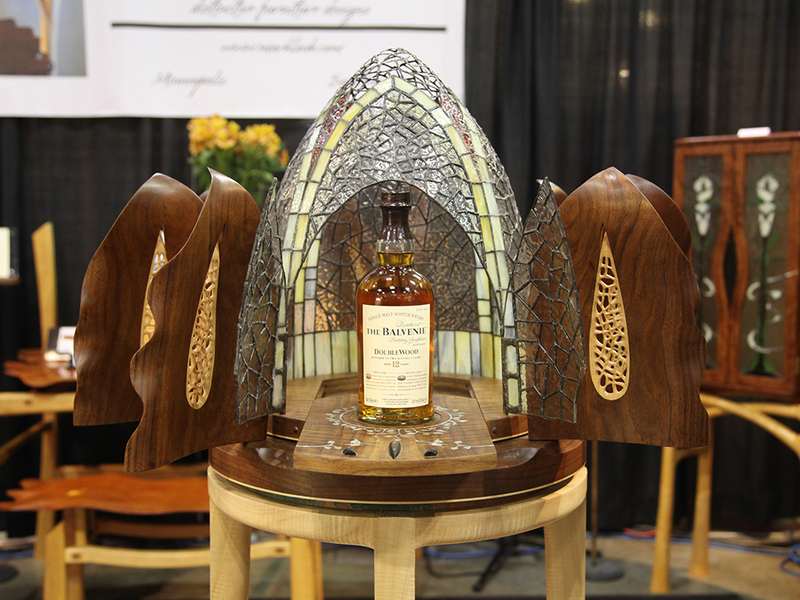 You may have seen his work at the American Craft Show in St. Paul, where he has won Awards of Excellence. 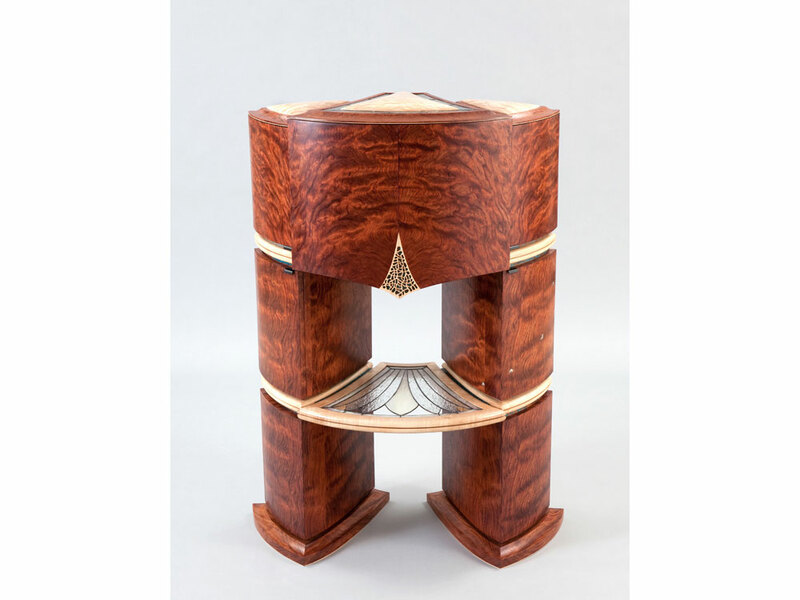 Learn a bit more about his craft practice and be sure to stop in and see Laub's work in person through the end of June. I think I make furniture, but I’m not really sure. My work is always pretty, but rarely functional. 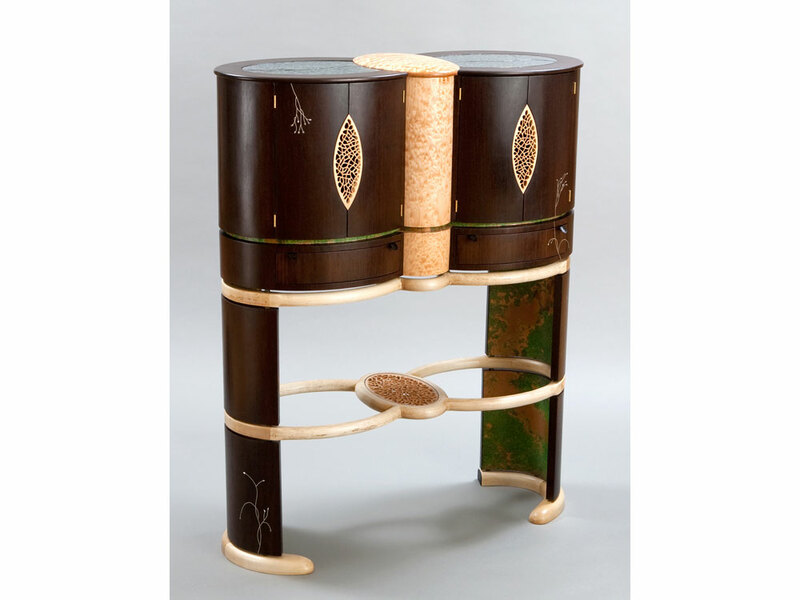 I like to create artful objects that encourage and reward close examination and exploration. My specialty is display cabinets and consoles. 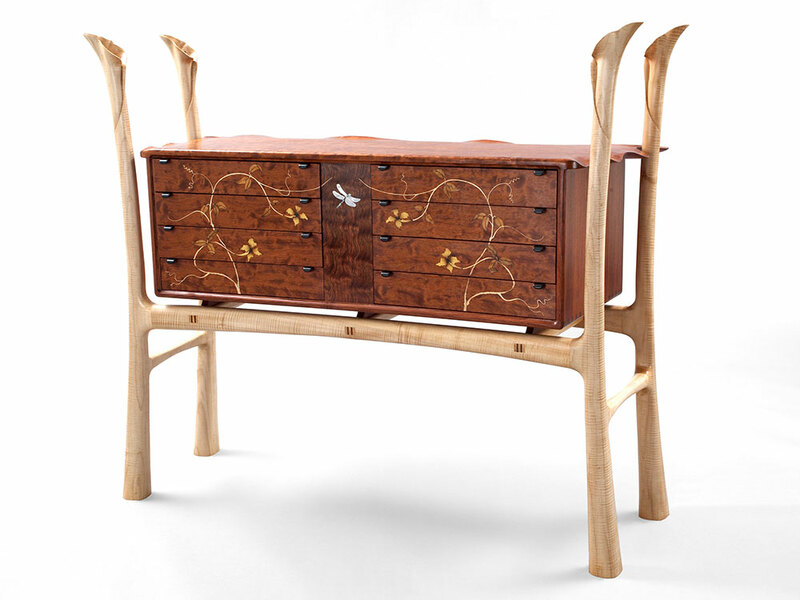 The real beauty of these pieces lies within, hidden in drawers and behind doors. Inspiration is everywhere. In no particular order, I am inspired by William Blake's poetry, Erte clothing, Collins Avenue architecture, the rings of Saturn, scarab beetles, succulent plants, calla lilies, the fenders of a 1948 Delahaye, the revolving door at the Hotel Danieli in Venice, the elevator doors in the Chrysler building, the tracing flight of swallows, Bruce Springsteen, Neil Young, and Frederic Chopin. How did you first become in engaged in craft? I spent 20 years in the corporate world. It felt like centuries. Life has been better since I jumped and the net appeared. I wound up happier using my hands and heart instead of only my brain. It took a long time, but I recognize now that by making things I am able to make deposits in my heart account as well as my bank account. My dream studio would be in the Santa Monica mountains overlooking the Pacific ocean. I would set up my shop in Van Morrison’s 1970s home recording studio and fall in love with the woman living in his garage apartment. Wait – that is where I did spend last winter, making Queen of the Slipstream. I take great comfort knowing that as an artist, I travel the same ancient highway as the great masters. Throughout time, all societies and cultures are remembered for their art. While, of course, I obviously will never come close to that level of expertise, I do enjoy the journey on that well-worn road. I love what I do, so I will never work another day in my life. What is your favorite/most read arts or craft book in your personal collection? The Power of Limits: Proportional Harmonies in Nature, Art, and Architecture by Gyorgy Dozci. After reading this book, you will never see nature or listen to music the same way again. On View is a brief Q&A with artists whose work is currently on view at the American Craft Council.